14 in '14 , How am I Doing? My big conquest for 2014 is to complete 14 distance events before the year ends. Originally, I'd hoped for these 14 events to be half marathons. Due to my location (Iowa), and the expense of traveling from my location to where there would be half marathons available (year-round), I realized (already in January) I would need to modify my goals. I decided to define a "distance event" as a race longer than a 10K, and I also decided to include a few virtual events in the mix. There are not a lot of races during the winter months in Iowa, and the few races that do exist are mostly 5K's. 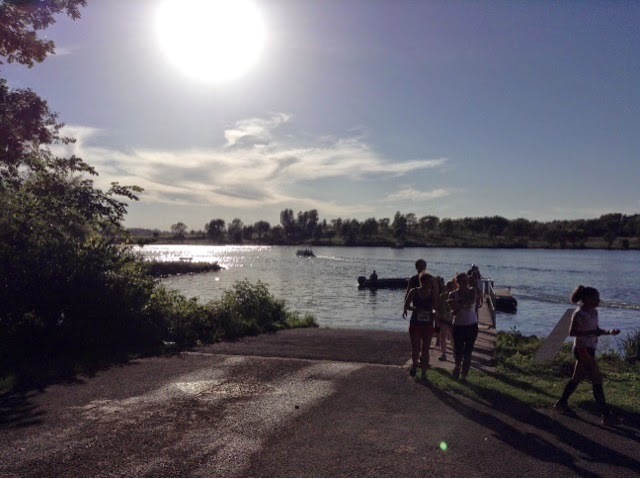 June is winding down, 2014 is almost half over, where do things stand with my 14 in '14 goal? I'm happy to report I am more than halfway there! Things are on track (no pun intended). Here's a brief recap of the first six months....starting with January. 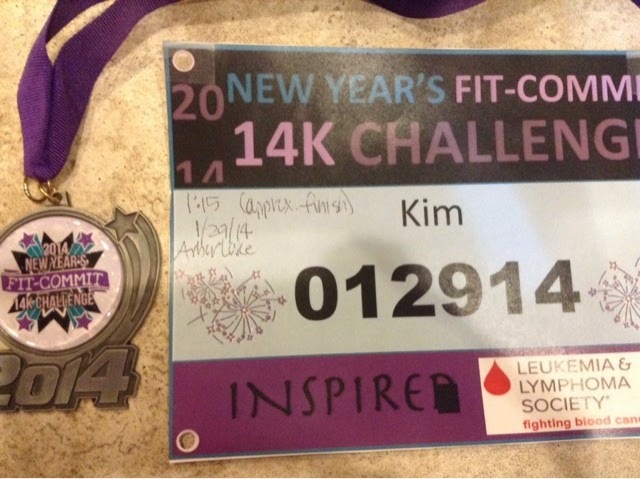 My first event (a virtual) was the 2014 New Year's Fit-Commit 14K Challenge. Our winter was especially cold this year, so it was a real challenge getting this race completed within the allotted time frame. Most days the temps in my hometown of Grinnell were not just below freezing, but many were sub-zero with windchill. Fortunately, we had one day towards the end of the month with temps in the 40's...so I made it mine. 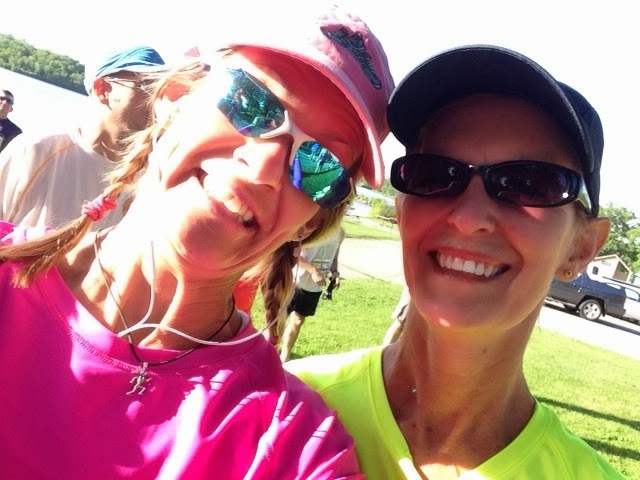 I February, I ran another virtual event, this one affiliated with Moms RUN This Town, opting for the half marathon distance (there also was the option of a 5K or 10K). This was called the Start Your Engines event, and I had to play a bit of a waiting game in hopes of scoring a somewhat "warm" Iowa day in the frigid winter, and was able to run it on February 22nd. 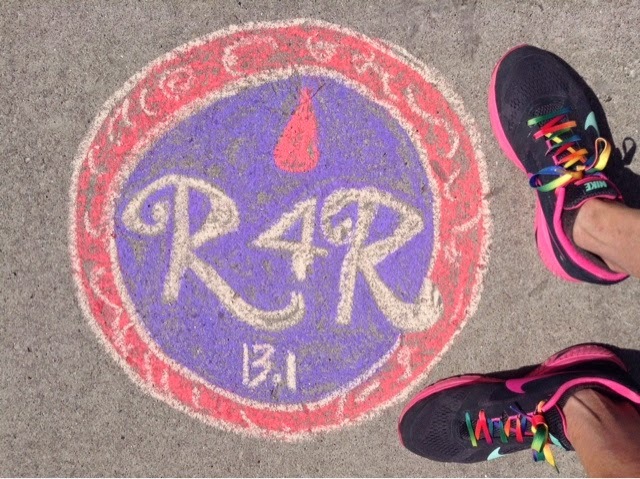 My third distance event was the Run 4 Reagen, another virtual which I managed to run on March 30th. 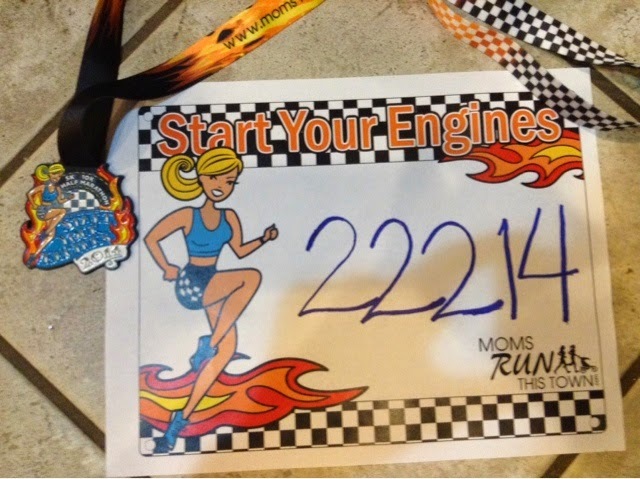 This event also had several distance options, but I elected to run the half marathon. My husband ran the first six miles with me, and a friend met me at the start of mile seven and kept me company through the remaining 7.1 miles. 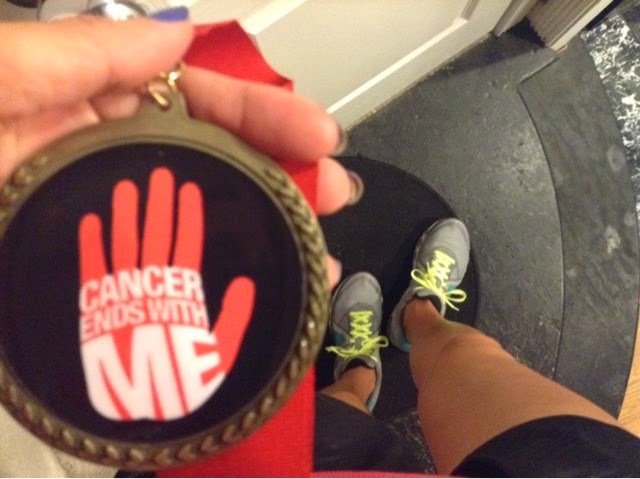 April brought me another virtual, the Cancer Ends with Me 10-Mile Challenge on the 2nd. 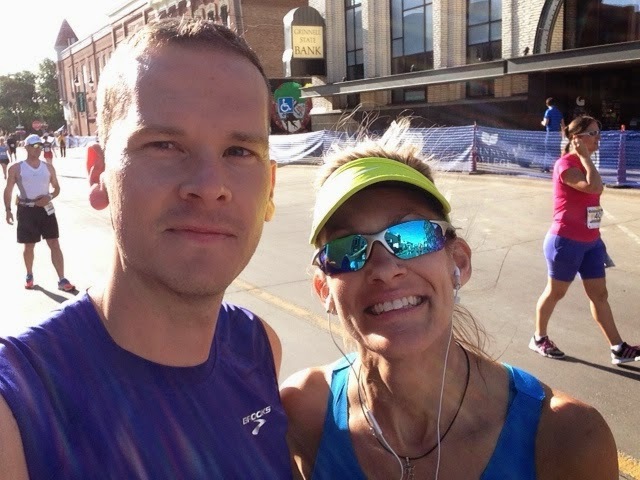 Later in the month, on the 26th, I finally had my first "official" distance race of 2014, the Hy-Vee/Drake Relays Road Races Half Marathon. May was busy. 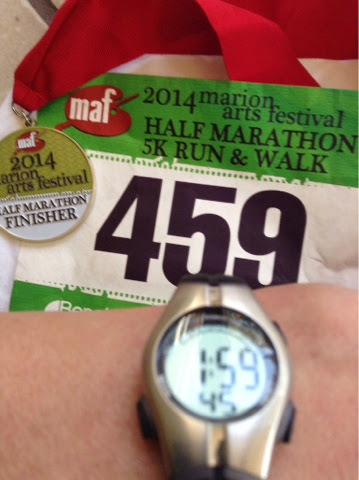 I ran the Marion Arts Festival Half Marathon on May 15th and Dam to Dam Half Marathon on the 31st. 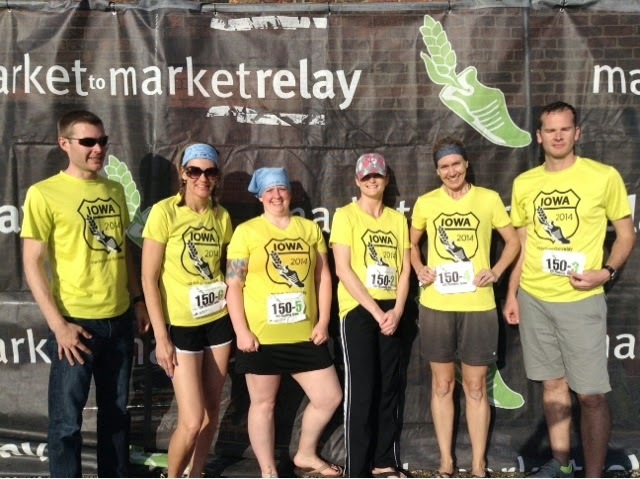 Also in May, on the 10th, a team of five co-workers and myself ran the 75-mile trek of the Market to Market Iowa Relay. I ran two of the legs, totaling about 7.5 miles. I'm keeping this event as a back-up, in case I come up short on completing 14 events. 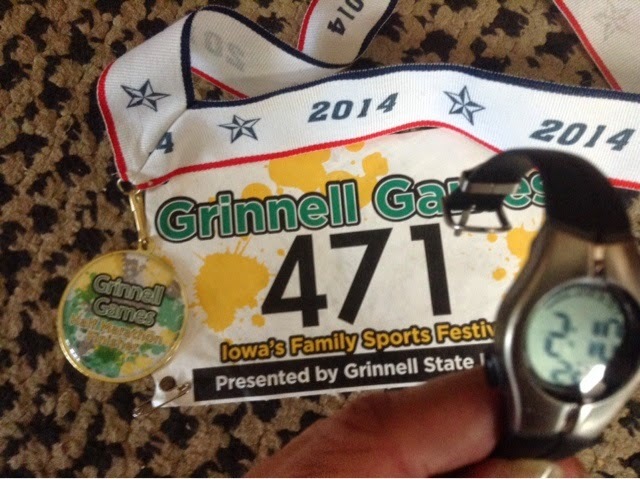 Finally, last weekend (June 14th), I ran the half marathon as part of the Grinnell Games, a local event. Currently, that gives me eight completed distance events (nine, if I choose to add in the 7.5 miles from the relay), so I am feeling great! 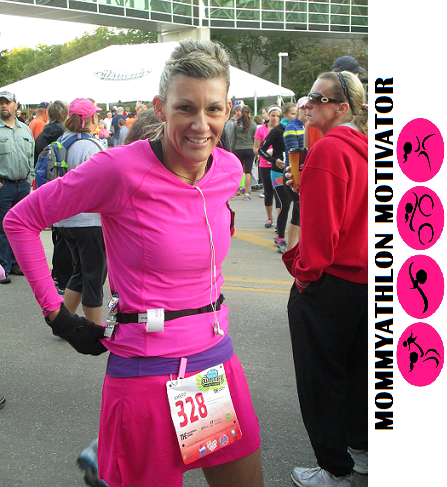 I have some more half marathons on my calendar, as well as a full marathon in October (yikes!). Wish me luck as I begin the second half of 2014! How about YOU? Any goals for 2014 you are working towards? Well, I'm starting to wonder if or when I will reach that point of total satisfaction. I reach one milestone, and I momentarily enjoy the feat, then move on to something bigger (or at the very least, more challenging). Case in point, I took on a new challenge this weekend. 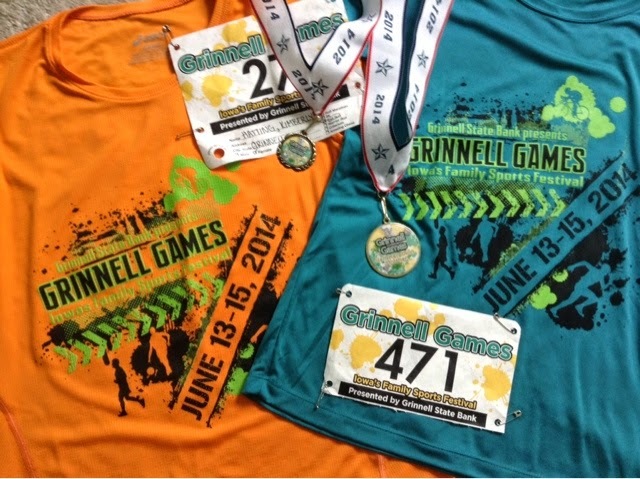 Our town hosts the Grinnell Games each summer, a weekend of events for participants of all ages and abilities. 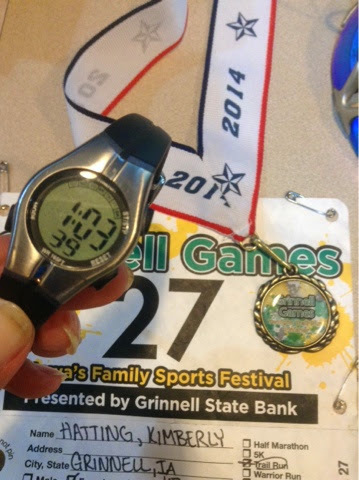 Every year, the Grinnell Games has grown by adding new events to the roster. 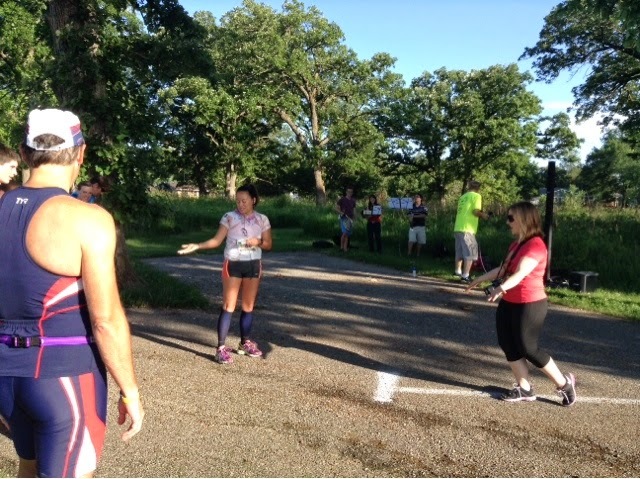 This year, the featured events were the 10K Twilight Trail Run, 5K run/walk. 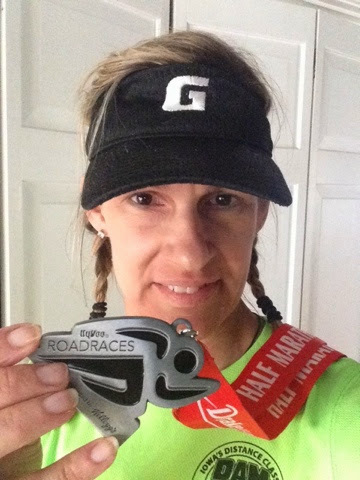 Half Marathon, 3-on-3 Basketball, Dodgeball, Bike Criterium, Warrior Run, and the Amazing Chase (a local version of the TV show, The Amazing Race). 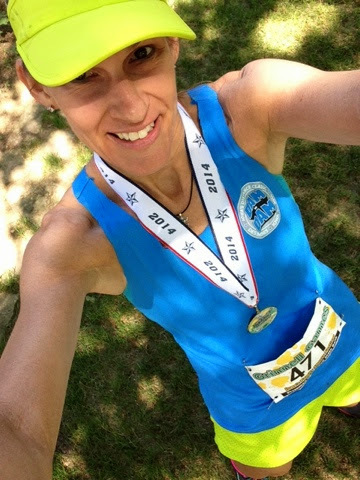 I have run the half marathon and 10K trail run before.....but never in the same year. 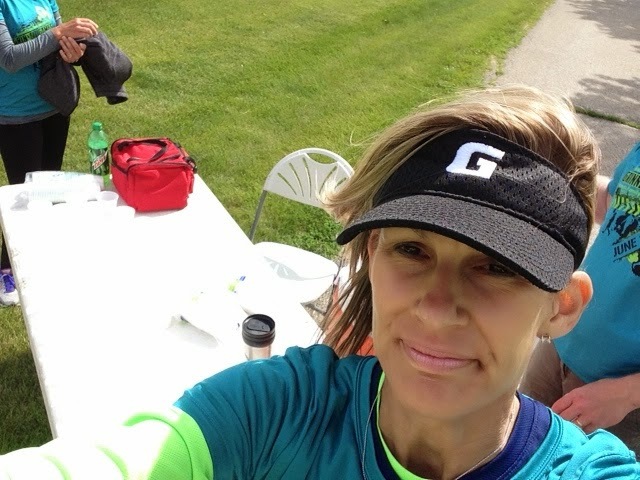 The trail run was on Friday evening, and the half marathon was on Saturday morning. Yes, 13 hours apart. And I decided this was the year I would run both of these, back-to-back. Why take on a challenge such as this? 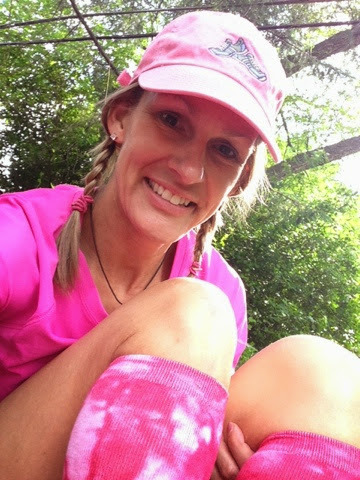 I have run a few trail races and know how difficult they are, and I have run several half marathons and also know what it takes to conquer 13.1 miles. I am not afraid of either distance or event, so I simply wanted to see how much harder it would be to do both. I knew going into this, there would need to be a strategy to successfully finish each race not only in good spirits, but also in moderate comfort. To go for a PR in either event would not be the priority, but rather to run each race with a conservative pace to keep the energy from depleting. Also, having done prior trail races, I knew how beat up my body felt upon finishing them. The constant hills and rough terrain made my legs and ankles feel like jello, so I would really need to run with caution if I had any hope of doing a half marathon less than 13 hours later. When I ran this trail race last year, due to excess rain and flooding, it had been re-routed. This year, we ran most of it in the rough. We parked near the finish line and were ferried across a lake to the start line. The temps were pleasant (in the mid-60's), and there was a cool breeze. I am paranoid about ticks, so I wore a long-sleeved top, knee socks and a hat to keep the critters at bay. At times, I was pretty warm, but the majority of the race was under pretty thick shade cover. The course was very hilly, and had numerous tight, blind curves through the woodland. The hills were pretty constant, and most were quite steep. 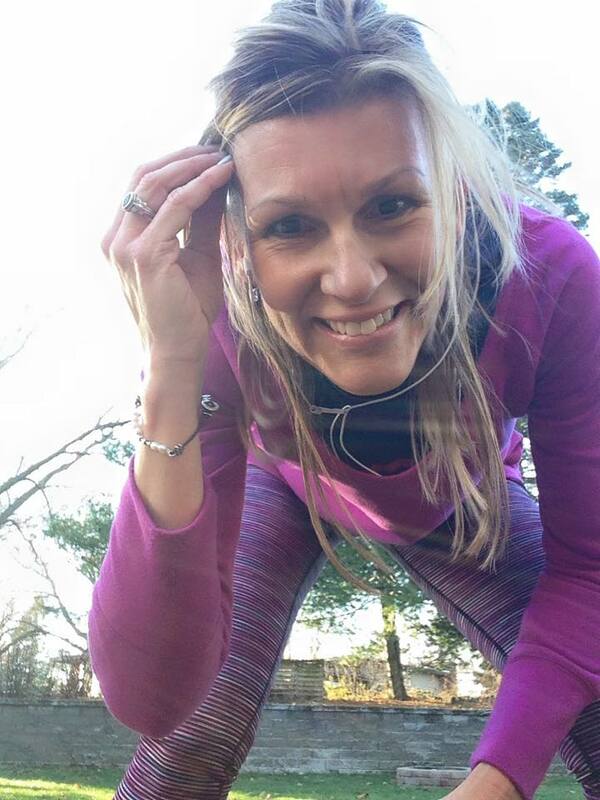 I checked my pace periodically at the mile markers, and was surprised to be keeping a steady 9-minute pace. I could feel my legs getting fatigued, though, so I slowed down somewhat after the halfway point. I knew I would regret it if I didn't ease up a little. The hills were tough. I have learned, depending on the steepness of the incline, it is possible to actually walk a hill faster than run it. 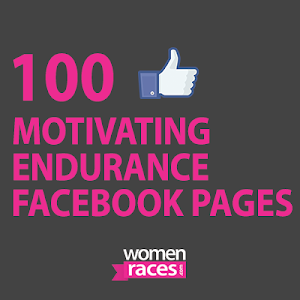 I have used this strategy several times on road races. Even though you are going a bit "slower" by walking, you can take longer strides with less effort, so you actually wind up netting a faster time when you reach the top and are less tired in getting there. I also "walked" down the really steep hills for the same reason....going slower allowed me to take longer steps and be assured of good footing on all the dirt, rocks and slippery grass. When I finally made it out of the woods, there was a short run on pavement before finishing the last half mile or so on some gravel and dirt. I crossed the finish line in 1:03:39, almost four minutes faster than last year. Even though this was a different route, I think it was more challenging than last year. There were constant hills, many of which were quite steep, so I was very happy with my finish time. Upon returning home, I immediately put BioFreeze on my hamstrings and calves as a precaution. I also did some stretching and foam rolling, and got to bed at a decent time. Saturday morning found me feeling a little stiff, but not really any pain other than a big blister on the "bunion area" of my right foot. I knew that could be a problem, so I pierced it and put a bandage on it. I had my ritual oatmeal and chai latte' and walked downtown. Usually, I need to drive to my races, so it was nice being able to just leave the house and walk. I live about a mile from where the half marathon was starting. I brought along some water to drink, a gel to slam down, and my IPod for a few pre-race pics. Ready for the start of the half marathon with a friend from work, Eugene...running his first 13.1! The route went right by my house, and it was a double loop. 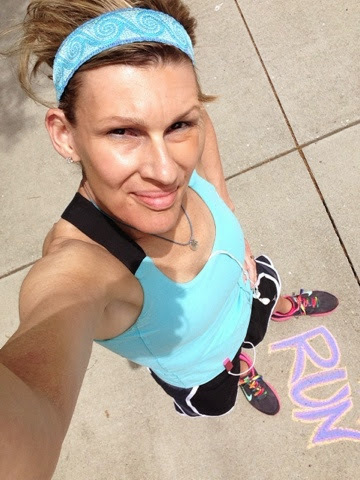 My plan was to hand over the IPod to one of my kids as I ran by, then have another gel as I came around the second time (which would be approximately at the 7.5 mile mark). Woot woot! 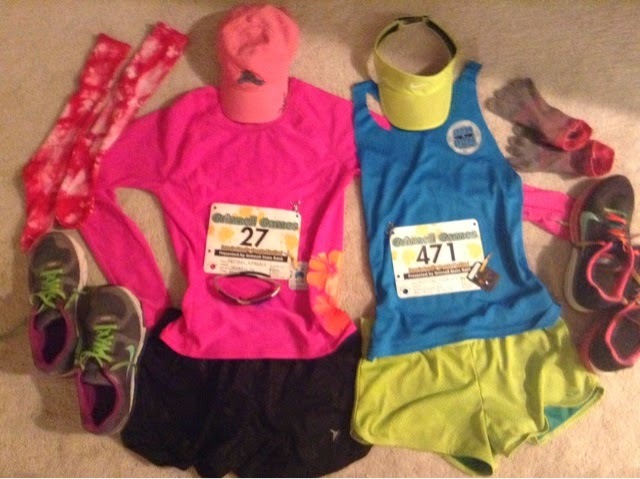 A half marathon without needing to carry anything! The temps for the half marathon were ideal (low 70's), but there was a very strong wind out of the southeast. There was plenty of sunshine, it was a beautiful morning! Maybe I was still on a high from the trail run PR, but I didn't have any anxiety about the 13.1 miles ahead of me. When I ran this race two years ago, it was a near disaster. I had done a 20K a week prior, so I probably wasn't as recovered as I should have been. Also, it was much hotter and very humid that morning. There also was a strong southeast wind, but it was a heavy and hot wind. My husband and I made it to nine miles, and then majorly struggled to press on to the finish. We had to intermittently run and walk because we were in so much pain. We crossed the finish line, hand-in-hand, and said, "Never again!" 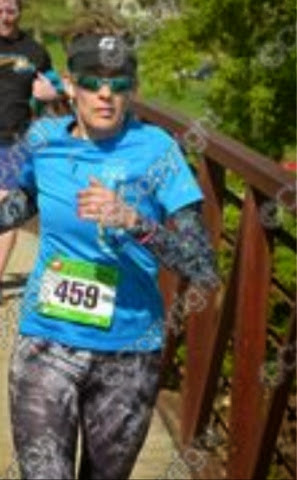 Yet, here I was, about to tackle this course a second time, with fatigued muscles from a tough race the evening prior. But my mind was at ease. My only goal was to finish the race, not race it. A few blocks after the first mile, the course turns onto a county road, heading east with a couple decent hills. The wind was strong, but not too massive (so far), and it actually felt good. Right after the 2-mile mark, we turned and headed south, going towards a large recreation area and soccer fields. The wind felt much stronger out at this area, since it was so open. We looped around the park and by mile 3.5, we were headed west, back in a residential area. It usually takes a few miles for me to find my groove, and this was no exception. My hamstrings felt better, and I had forgotten about the blister, so all was good! I have run this route several times on my own, so there were no surprises. Of course, that also means I know where each and every hill is. Fortunately, other than the hills on the county road, the few in this race are pretty subtle and fairly short. I made it back to the starting area and felt pretty good. I ran the first loop in 56 minutes, so my pace was doing well. 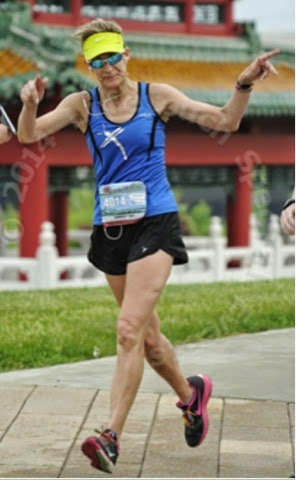 For a split second, I had a moment of pure fantasy.... Imagining myself continuing on and finishing under two hours! Then, reality brought me back as I remembered the second loop was what nearly defeated me last time. I still had those hills to conquer (again), and the wind to battle out near the soccer fields. As I rounded the corner and started the trek out on the county road, I could instantly tell the wind had picked up. Oh, here we go! I made it all the way along that road, but as soon as I turned the next corner (heading back towards the soccer fields), I knew my mojo was running low. The wind nearly knocked me over as I headed south. Keeping myself vertical, let alone moving forward, took every last ounce of energy against the wind. I was approaching the 9-mile mark, and knew I needed to walk for a minute. My energy felt fine, but I could tell my calves were fried after finishing those hills. I was hesitant to walk much, though, because they would start cramping. I walked briefly, then continued running. I knew my form was suffering because my legs were starting to feel weak. I did a few run/walk intervals through the soccer fields and that seemed to help, although the wind was not being very friendly. There were a lot of runners walking at this point, and all of them were complaining about the wind as well. I was able to grit it out and run most of the remaining miles, but I did need to do a few intervals of walking. 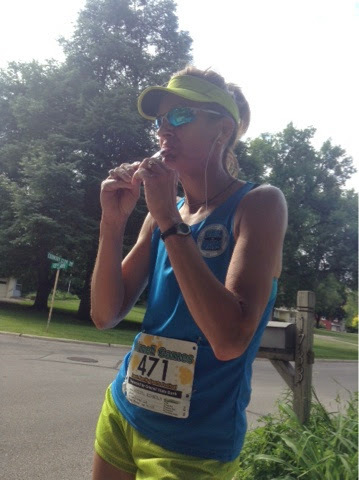 The great thing about doing a race in your home town, though, is that I knew most of the volunteers along the route, at the water stations and working traffic control on the corners. I made sure to thank all of them for supporting the race. I also asked several if they wanted to switch places with me (no takers). I glanced at my watch as I approached the final mile, and realized even though the sub-2-hour finish was not happening, I still would be finishing way faster than last time. This had been a pretty good race for me, despite the difficulty in the last few miles. (And, let's not forget, I had run 6 miles of hills less than a day ago) Then I remembered my goal had been to just finish this race, not go for a blazing PR (how had I forgotten that?). So I made my way through the final mile with what probably looked like a drunken smile on my face. I was about to finish the challenge of completing two difficult races back-to-back. And, somehow, from out of nowhere, I found the mojo to speed up and (somewhat) sprint to the finish line. I finished in 2:10:22. Not a 13.1 PR, but a PR for this course by 10 minutes! 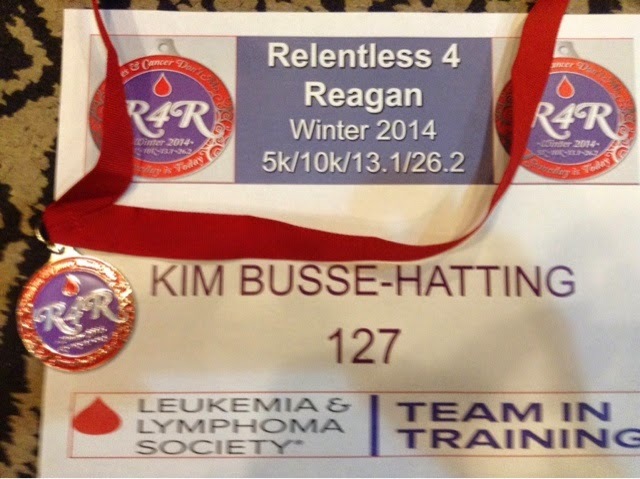 My goal had been to run both of these races "easy," and wound up PR'ing both of them. Go figure. I did it! Two challenging races back-to-back...and two PR's!! Was this an easy feat? No. Not by a long shot. As I mentioned, I wasn't afraid of the two races, but I had no idea how it would play out doing both of them within 13 hours of each other. Both races had their individual challenges, but combined proved to be a huge conquest. No, not an Ironman victory, but certainly close in mental toughness and physical stamina for me. These comfort zone violations scare me. Every time I attempt a new challenge, though, I learn more about myself, the biggest one being that I am more of an athlete than I give myself credit for...more of an athlete than I'd ever imagined I was capable of being. As I mentioned, the Grinnell Games is a weekend full of activities. The trail run was on Friday night, and most of the other events were on Saturday. The warrior run was Sunday morning, and the husband and myself volunteered at one of the water stations for that. It was great seeing so many people participating!